Not to be confused with Qadariyah, an early Islamic theological movement emphasizing free will. "Qadri" redirects here. For other uses, see Qaderi (disambiguation). The Qadiriyya (Arabic: القادريه‎‎, Persian: قادریه‎‎, also transliterated Qadri, Qadriya, Kadri, Elkadri, Elkadry, Aladray, Alkadrie, Adray, Kadray, Qadiri,"Quadri" or Qadri), are members of the Qadiri tariqa (Sufi order). This derives its name from Abdul-Qadir Gilani (1077–1166, also transliterated Jilani) who was from Gilan. The order relies strongly upon adherence to the fundamentals of Islam. The order, with its many offshoots, is widespread, particularly in the Arabic-speaking world, and can also be found in Turkey, Indonesia, Afghanistan, India, Bangladesh, Pakistan, the Balkans, Russia, Palestine, Israel, China, East and West Africa. The founder of the Qadiriyya, Abdul-Qadir Gilani, was a respected scholar and preacher. Having been a pupil at the madrasa of Abu Sa'id al-Mubarak he became leader of this school after his death in 1119. Being the new sheikh, he and his large family lived comfortably in the madrasa until his death in 1166, when his son, Abdul Razzaq, succeeded his father as sheikh. Gilani's son, Abdul-Razzaq Gilani, published a hagiography of his father, emphasizing his reputation as founder of a distinct and prestigious Sufi order. The Qadiriyya flourished, surviving the Mongolian conquest of Baghdad in 1258, and remained an influential Sunni institution. After the fall of the Abbasid Caliphate, the legend of Gilani was further spread by a text entitled The Joy of the Secrets in Abdul-Qadir's Mysterious Deeds (Bahjat al-asrar fi ba'd manaqib 'Abd al-Qadir) attributed to Nur al-Din 'Ali al-Shattanufi, who depicted Gilani is the ultimate channel of divine grace and helped the Qadiri order to spread far beyond the region of Baghdad. By the end of the fifteenth century, the Qadiriyya had distinct branches and had spread to Morocco, Spain, Turkey, India, Ethiopia, Somalia, and present-day Mali. Established Sufi sheikhs often adopted the Qadiriyya tradition without abandoning leadership of their local communities. 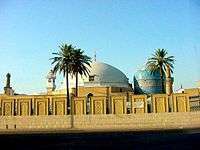 During the Safavid dynasty's rule of Baghdad from 1508 to 1534, the sheikh of the Qadiriyya was appointed chief Sufi of Baghdad and the surrounding lands. Shortly after the Ottoman Empire conquered Baghdad in 1534, Suleiman the Magnificent commissioned a dome to be built on the mausoleum of Abdul-Qadir Gilani, establishing the Qadiriyya as his main allies in Iraq. Khawaja Abdul-Allah, a sheikh of the Qadiriyya and a descendant of Muhammad, is reported to have entered China in 1674 and traveled the country preaching until his death in 1689. One of Abdul-Allah's students, Qi Jingyi Hilal al-Din, is said to have permanently rooted Qadiri Sufism in China. He was buried in Linxia City, which became the center of the Qadiriyya in China. By the seventeenth century, the Qadiriyya had reached Ottoman-occupied areas of Europe. Sultan Bahu contributed to the spread of Qadiriyya in western India. His method of spreading the teachings of the Sufi doctrine of Faqr through his Punjabi couplets and through his writings which exceeded to more than 140. He granted the method of dhikr and stressed that the way to reach Divinity is not through asceticism or excessive or lengthy prayers but it is selfless love carved out of annihilation in God called fana. The Qadiriyya Zawiya (Sufi lodge) in the medina of Libya's capital Tripoli. Qadiri leadership is not centralised. Each centre of Qadiri thought is free to adopt its own interpretations and practices. The symbol of the order is the rose. A rose of green, and white cloth, with a six-pointed star in the middle, is traditionally worn in the cap of Qadiri dervishes. Robes of black felt are also customary. Names of God are prescribed as chants for repetition by initiates (dhikr). Formerly several hundred thousand repetitions were required, and obligatory for those who hold the office of sheikh. Any person over the age of eighteen may be initiated. They may be asked to live in the order's commune (khanqah or tekke) and to recount their dreams to their sheikh. Celibacy, poverty, meditation, and mysticism within an ascetic context along with worship centered on saint's tombs were promoted by the Qadiriyya among the Hui in China. In China, unlike other Muslim sects, the leaders (Shaikhs) of the Qadiriyya Sufi order are celibate. Unlike other Sufi orders in China, the leadership within the order is not a hereditary position, rather, one of the disciples of the celibate Shaikh is chosen by the Shaikh to succeed him. The 92-year-old celibate Shaikh Yang Shijun was the leader of the Qadiriya order in China as of 1998. The Qadri Noshahi silsila/offshoot was established by Syed Muhammad Naushah Ganj Bakhsh of Gujrat,Punjab, Pakistan in the late 16th century. Notable Sufi in this order are Sayeen Shams Ali Qalandar of Shamsabad, Hujra Shah Muqeem, Pakistan. The Qadri-Qadeeri order was founded by Muhammad Abdul Qadeer Siddiqi Qadri (1870–1962), the former dean and professor of Theology at the Osmania University, Hyderabad. He was a southern Indian Sufi widely known as Bahr-ul-Uloom (Ocean of Knowledge). Siddiqi's spiritual chain can be traced back to Abdul Qadir Gilani. Also known as Qadiriya Sultaniya, the order was started by Sultan Bahu in the 17th century and spread in the western part of Indian Subcontinent. Hence, it follows most of the Qadiriyya approach; in contrast, however, it does not follow a specific dress code, seclusion, or other lengthy exercises. Its mainstream philosophy is contemplation of belovedness towards God. This branch of the Qadiriyya came into being in the eighteenth century resulting from a revivalist movement led by Sidi Al-Mukhtar al-Kunti, a Sufi of the western Sahara who wished to establish Qadiri Sufism as the dominant religion in the region. In contrast to other branches of the Qadiriyya that do not have a centralized authority, the Mukhtariyya brotherhood was highly centralized. Its leaders focused on economic prosperity as well as spiritual well-being, sending their disciples on trade caravans as far as Europe. 1 2 Gladney, Dru. "Muslim Tombs and Ethnic Folklore: Charters for Hui Identity" Journal of Asian Studies, August 1987, Vol. 46 (3): 495-532; pp. 48-49 in the PDF file. ↑ Abun-Nasr, Jamil M. "The Special Sufi Paths (Taqiras)." Muslim Communities of Grace: The Sufi Brotherhoods in Islamic Religious Life. New York: Columbia UP, 2007. 86-96. ↑ Jonathan Neaman Lipman (1 July 1998). Familiar strangers: a history of Muslims in Northwest China. University of Washington Press. pp. 88–. ISBN 978-0-295-80055-4. ↑ Burkurdari, Hafiz Muhammad Hayat. Tazkirah Noshahia. ↑ "Tasawuf/Sufism & teachings of Shams Ali Qalandar". Hazrat Shams Ali Qalandar. ↑ Abun-Nasr, Jamil M. "The Centralized Sufi Brotherhoods." Muslim Communities of Grace: The Sufi Brotherhoods in Islamic Religious Life. New York: Columbia UP, 2007. 163-170. Abun-Nasr, Jamil M. "The Special Sufi Paths (Taqiras)." Muslim Communities of Grace: The Sufi Brotherhoods in Islamic Religious Life. New York: Columbia UP, 2007. 86-96. Chopra, R. M., "SUFISM", 2016, Anuradha Prakashan, New Delhi. ISBN 978-93-85083-52-5.